I have to confess that I found this one looking for something with Calvados in it. In looking at it, it had pretty much everything I love. It’s old. It’s chock-full of screwball booze. Also, it turns out to be really good as well. David Wondrich gives credit to a German bartender named George J. Kappeler at the Holland House hotel on Fifth Ave. and Thirtieth St. in New York for it’s invention. Apparently it as all the rage before the turn of the last century. Almost all of the recipes I found for this cocktail call for Yellow Chartreuse, a lower proof, milder version of its older sibling (the yellow was introduced in 1838) Green Chartreuse. Even the original Kappeler version calls for the yellow stuff. Problem is that I like Green Chartreuse. Robert Hess makes the cocktail in one of his Cocktail Spirit video blogs and mentions the if you are using the green variety to use half as much. Finally Ti Adelaide Martin and Lally Brennan call for the full amount of Green Chartreuse in their In the Land of Cocktails book. Well I like the way they think. Stir in a cocktail mixer with ice and strain into a chilled cocktail glass or coupe. A couple of notes: I haven’t seen anyone recommend a garnish, but I was feeling like I wanted a drink toy to amuse myself with that afternoon, so I threw in a cherry. Also, if you want the original version or if you find it a little harsh, use the Yellow Chartreuse. B & I really like this one. In fact as soon as I hit post, I think one might be on the agenda. I love the Widow’s Kiss. It is the perfect autumn cocktail. I tried it with Laird’s Applejack as well, and while not as sophisticated, it is still an excellent drink. Nan and I also use a cherry for garnish. 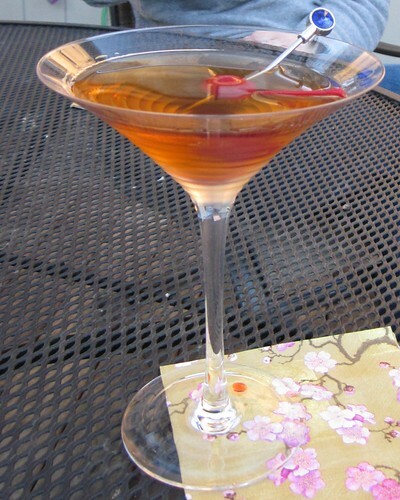 A maraschino cherry, while good, over powers the cocktail a bit. Pip, pip. I like the Applejack idea. I am definitely going to give it a try.